The incredible run of Apple stock has been well-documented along with most of the company’s history and ground-breaking products. As daunting as it may seem now, imagine what a small investment in a company like Apple several years ago would be worth today. A mere $100 investment in the company’s stock at the beginning of 2002 would have grown to more than 95 times the original investment by mid-February 2019. Read on to find out what an initial $100 investment from 2002 would look like today. Note: All Apple stock price quotes in this article are outright prices, not prices adjusted for dividends and splits. The effect of stock splits is noted and calculated into the total result. But the effect of dividends, which would slightly enhance the value of the investment, is not reflected in this review. Apple launched its initial public offering (IPO) on Dec. 12, 1980, selling 46 million shares at $22. The company’s shares sold out almost immediately and generated more capital with its public offering than any other company since Ford went public in 1956. Because of the large number of shareholders, the company had to hold its first shareholder meeting as a public company at De Anza College’s Flint Center in Cupertino. The theater holds about 2,300 people. It’s easy to view Apple as a monumental success story now, but the truth of the matter is that the beginning of this investment adventure would not have started out too well. The closing share price quoted for Apple for Jan. 2, 2002, the first trading day of the year, was $23.30. Rounding to the nearest whole share, a $100 investment would have secured four shares of Apple stock. But by the end of 2002, the stock price declined to $14.33 a share, which represented an approximately 40% loss in the hypothetical $100 stock purchase made at the start of the year. However, the next couple of years were refreshingly lucrative for Apple investors as the company continued to advance in the marketplace with more advanced versions of its popular iPod, and the opening of the iTunes store in 2003. By the end of 2004, Apple’s stock price climbed to $64.40 per share, making an original four share investment worth $257.60. In February 2005, Apple initiated a two-for-one stock split, which would have transformed the original four share investment into a total of eight shares. In 2006, Apple debuted the MacBook Pro, the second Apple desktop computer product with Intel’s core duo processor. In 2007, it followed up with the launch of the now famous iPhone, which revolutionized the cell phone industry. The iPhone 3G followed in 2008 and in 2010 the iPhone 4 was introduced, along with another soon-to-be wildly successful product, the iPad. The stock’s closing price at the end of 2005 was $71.89, giving a total eight-share value of $575.12. Two years later, the 2007 closing price was $198.08, making the hypothetical investment worth $1,584.64. The stock suffered approximately a 50% downside retracement in 2008, closing out the year at $85.35 a share. However, in 2009 Apple stock resumed its long-term uptrend, and closed out 2010 at $46.08 a share, which, multiplied by eight shares, equals $368.64. It may have been tempting for an investor to sell at that point, having more than tripled their original investment. But that would have been a short-sighted mistake, as there was more good fortune in store for Apple shareholders. Apple’s status as a leading firm in the technology sector has only enhanced and solidified in the past decade as the company regularly introduced new and improved versions of the iPhone and the iPad, unveiled the Apple Watch, while the number of iTunes subscribers continues to grow. Apple stock began a steep uptrend between mid 2010 and 2015. During this period, the stock only suffered one major downside correction which extended from late 2012 through mid-2013 when stock price retraced from $100.01 on Sept. 17, 2012 down to $56.65 a share on June 24, 2013. Following that corrective retracement, the stock resumed an even sharper uptrend, one that lasted into the first half of 2015. In June 2014, Apple did a seven-for-one stock split, so at that time, eight shares would have become 56, which sold for $93.70 per share immediately following the split. That would make the hypothetical investment worth $5,247.20. When the stock price hit its 2015 high closing price of $133.00 a share, 56 shares were worth $7,448. Subsequent price action saw Apple stock in another downside correction. On April 12, 2019, Apple closed at $198.87. Multiplied by 56 shares, the total value is $11,136.72. That’s not a bad return on a $100 investment. How Does Apple Stock Look Now? Going forward, Apple is still a leading technology firm, despite the death of Steve Jobs. In all likelihood, it will continue to outperform in the sector. As of Feb. 12, 2019, Apple had a market capitalization value of $937.7 billion. Apple’s market cap hit $1 trillion on Aug. 2, 2018 — the first publicly traded company to ever reach that mark. The company’s share prices rose as high as $233.47 after it reached that milestone. Apple has a price/earnings ratio (P/E) of 16.41. Apple’s return on assets (ROA) and return on equity (ROE) figures are also substantially above average. Because Apple stock comes at such a premium, it may not be feasible for most retail investors to buy shares in the company outright. But that doesn’t mean you can’t take part in the action. After all, it’s one of the most recognized brands in the world. 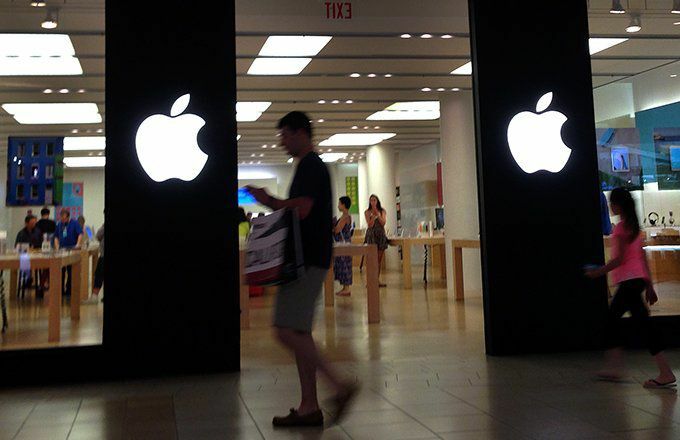 Consider investing in a mutual fund or an ETF that has a position in Apple. Unlike mutual funds, ETFs don’t require a minimum investment and many are commission and/or fee-free. But if you’re really set on buying actual shares in the company, consider setting a minimum aside in your brokerage account and buy fractional shares. You can buy a little at a time until you secure a full set of shares. While it certainly would have been wonderful to acquire Apple stock for just a little over $20 a share in hindsight, that doesn’t mean the stock isn’t now also worth buying at a just under $200 a share. Apple’s financials look strong across the board, and the company has more than established its ability to introduce quality products and win in the marketplace. Therefore, investors may do well to consider buying Apple for future returns on investment.